The chopper-stabilized amplifiers designed at Cirrus Logic are unique. These amplifiers offer performance benefits that combine the best features of bipolar amplifiers with the best features of chopper amplifiers. The intent of this application note is to understand Cirrus Logic’s unique technology and to see how it can be applied in various measurement applications. 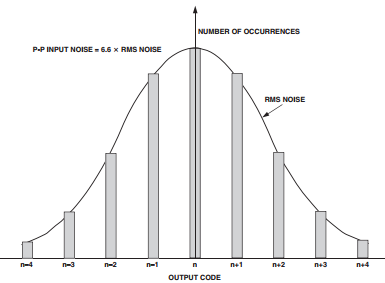 This application note describes two operations associated with using headset. The first is the facility to automatically switch between a mono ear speaker and stereo headphones for use in a Smartphone, PDA etc. The second operation is a method which can be used to detect if stereo headphones have been attached or if a mono headset with microphone has been attached. MEMS microphones are small form factor microphones, which translate acoustic sound pressure input into an electrical output response. They utilise the silicon wafer processes from the microelectronic industry to create high performance microphones of increasingly smaller geometries. These processes give MEMS microphones a number of advantages over conventional electret condensing microphones (ECM), which has resulted in a general market transition to MEMS technologies for many of the latest consumer applications, including those requiring multi-microphone support or high quality capture. The aim of this applications note is to enlighten readers with little or no experience of MEMS microphones to a point that they are confident in basic terminology and able to understand datasheet information to make product selections. Personal authentication is becoming a key requirement for various electronic devices. Besides of the pin number, today most systems are based on so called biometric “properties”. Biometrics can include fingerprints, facial features, retina, iris, voice, fingerprint, palmprints, vein structures, handwritten signatures and hand geometry. All these biometrics have various pros and cons. However, only iris recognition claims to be a ‘hard-to-spoof’ system in combination with an ultra-low false acceptance rate (i.e. one in a million). Additionally, it also features greater speed, simplicity and accuracy compared to other biometric systems. The traits of iris recognition systems rely on the unique patterns of the human iris which are used to identify or verify the identity of an individual. 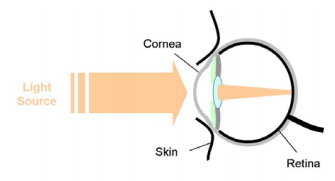 As the radiated optical power of light emitting diodes (LEDs) has increased in recent years, the issue of eye safety has received an ever-increasing amount of attention. Within this context there has been much discussion about the right safety standard either the laser standard IEC-60825 or the lamp safety standard IEC-62471 to apply to the classification of LEDs. Before mid 2006 all LED applications were covered by the IEC-60825. Today most of the LED applications are covered by the lamp standard. Other than lasers, lamps are only generally defined in this standard as sources made to produce optical radiation. 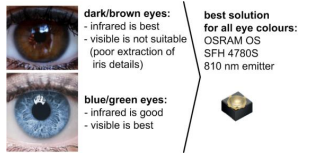 Lamp devices may also contain optical components like lenses or reflectors. Examples are lensed LEDs or reflector type lamps which may include lens covers as well. The status quo is, that for different applications of LEDs, like data transmission or irradiation of objects, different standards have to be used: data transmission IEC-60825 & lamp applications IEC-62471. Both safety standards do not cover general exposure scenarios and are not legally binding. The purpose of this standard is to specify requirements for the construction and testing of electrical apparatus, or parts of such apparatus, having circuits that are not capable of causing ignition in Division 1 Hazardous (Classified) Locations as defined in Article 500 of the National Electrical Code, ANSI/NFPA 70. Limiting exposure to high surface temperatures and requirements for dust-tight enclosures are key aspects of the UL913 standard. Light Emitting Diodes (LEDs) are fast becoming the most popular lighting option. Industry forecasts anticipate the market will continue to expand at an annual rate of 20% from 2011 to 2016, with the greatest growth coming in the commercial and industrial lighting sectors. As incandescent lamps have been made largely obsolete, given the U.S. government’s mandate to save energy, they have frequently been replaced by LEDs due to their long life (typically 25,000 hrs.) and the ease of adapting them to many different socket and shape requirements. However, LED lighting control presents a few problems not encountered with incandescent lamps. For example, with much less current from the LED load, normal types of triacs may be challenged in terms of latching and holding current characteristics. Triacs make up the heart of AC light dimming controls. Triacs used in dimmers have normally been characterized and specified for incandescent lamp loads, which have high current ratings for both steady-state conditions and initial high in-rush currents, as well as very high end-of-life surge current when a filament ruptures. Because they are diodes, LEDs have much lower steady-state current than incandescent lamps, and their initial turn-on current can be much higher for a few microseconds of each half-cycle of AC line voltage. Therefore, a spike of current can be seen at the beginning of each AC half-cycle. Typically, the current spike for an AC replacement lamp is 6–8 A peak; the steady-state follow current is less than 100 mA. Designing an AC circuit for controlling LED light output is very simple when using the new Q6008LH1LED or Q6012LH1LED Series Triacs because only a few components are required. All that is needed is a firing/triggering capacitor, a potentiometer, and a voltage breakover triggering device. 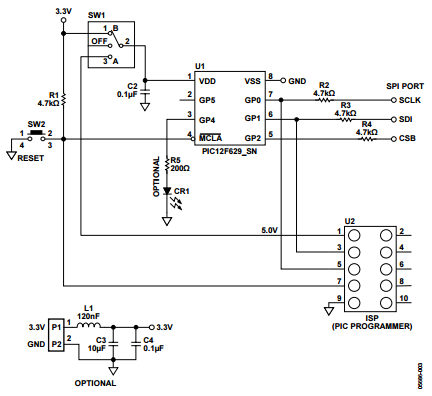 This application note describes the operation of a general purpose, microcontroller-based Serial Port Interface (SPI) boot circuit. This is a low cost solution for users who need to modify some of their device’s parameters at power up. This circuit addresses a 3-wire SPI application for programming converters, or any device that has a SPI option, and sends commands to user-defined SPI registers. The low bandwidth, high resolution ADCs have a resolution of 16 bits or 24 bits. However, the effective number of bits of a device is limited by noise. This varies depending on the output word rate and the gain setting used. This parameter is specified by some companies as effective resolution. Analog Devices specifies peak-to-peak resolution, which is the number of flicker-free bits and is calculated differently from effective resolution. This application note distinguishes between peak-to-peak resolution and effective resolution. LED back lights on LCD modules are generally driven with a dc voltage through a current limiting resistor. This simple approach is perfectly acceptable for most applications. When the primary consideration is an extra bright display, the lowest possible power consumption, or a back light that can be controlled over a very wide brightness range another method is needed. The purpose of the paper is to describe this method.